We offer custom fight gear at the lowest prices on the web. There are no minimums, however, prices depend on the size of the order. Please email us with your design or send us your graphics and color scheme and we will design your shorts for you. We offer 100% embroidery and screen printing to meet all of your needs. 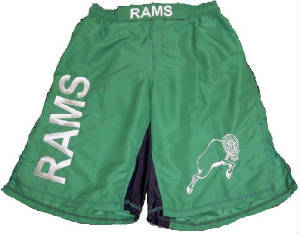 We can customize shorts, shirts, gloves, coins, towels, warm-up suits, GIs/kimonos, and much more. If you see a product on our site, we can customize that same product for you. Customized products take 4 - 6 weeks for delivery from the time payment is received. These custom fight shorts were designed for a high school wrestling team. They provided their logo and color scheme and we developed these shorts for them. We have designed many other shorts for Combatives Clubs and look forward to working with you. Thank you for looking.